Mizuno's Sensor Point™ palm, applies top quality embossed digi-suede in strategic locations for improved grip and improved durability. 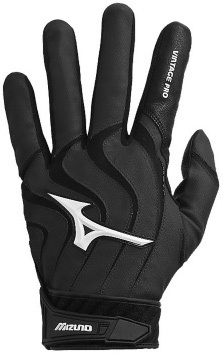 Mizuno Motion Arc Line™ mimics the movement of your skin to provide outstanding fit and feel. Mizuno's Grip Tabs help ease gloves on and off your hands. Mizuno FlexMesh for improves breathability. FlexMesh palced in thumb for additional flexibility.